Much ado has been made about the pronouncements of Alexandria Ocasio-Cortez, and I’m uncertain as to why. As a junior Representative from a reliably blue district, she’s neither going to be seen as a guidepost toward winning key swing seats nor as an experienced partisan who can get legislation moved. Her recent attacks on Speaker Pelosi, who controls things like committee assignments, are further guarantees she is going to wield no significant influence in Congress. 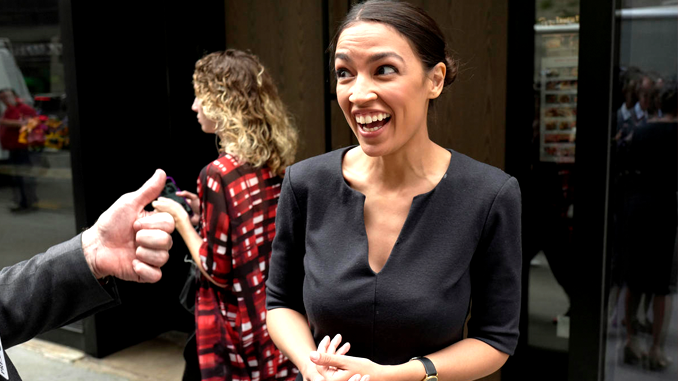 Her proponents seem to be the most radical members of the Democrat base, who are trying to grow their influence; and the punditry of the Republican party, who treat her every statement as if it carried more weight than those of Chuck Schumer. One might almost suspect the Republicans were trying to promote her as the face of the Democrat party with the expectation that she’d make their future elections easier, knowing there’d be no chance that simple name recognition, empty sloganeering and “Republican tears” would be enough to ensure that she’d never wind up President when she aged into eligibility. It certainly seems like a great strategy. No other blatantly incompetent politicians have walked into the Presidency purely on the merit of not being their vilified opponent. I can say that, because this is a humor piece. Anyway, Ocasio-Cortez introduced a Green New Deal into Congress this week. In the same way Republicans offered hesitant praise to some of then-Candidate Trump’s most outlandish statements at the beginning of his run (with the expectation of grabbing his mindless-rabble early followers when he – as they firmly believed he would – crashed and burned) some prominent Democrats have offered mild praise to the plan. This, despite their recognition that key parts of it are completely ludicrous. Rather than join the hard left and “new right” in treating this seriously, however, we at TNB dug deep and uncovered more important parts of the proposal, the ones which were reluctantly pared from the final package. “Stream Power” – All urinal bowls will be engraved with pictures of Donald Trump and/or Nancy Pelosi, with small hydroelectric generators attached. Businesses will be powered by the energy generated from urinal use. Universal access to teleportation devices. All magazines targeting pre-teen girls must feature Cenk Uygur, the founder of the AOC-launching Justice Democrats, on their cover. At least one article per year must explain that the Armenian Genocide never happened. A maximum wage, to properly balance out the minimum “family-sustaining wage” that remained in the package. The maximum wage shall be the exact amount of the minimum wage. Exceptions must necessarily be made for politicians, their family, and their closest associates. High-speed rail systems to and around all international combat zones, to a scale where air travel stops becoming necessary. Universal access to universal access.